On August 22, 2007, I attended a presentation by Kothy Hafersat at my local Viking Sewing Gallery. 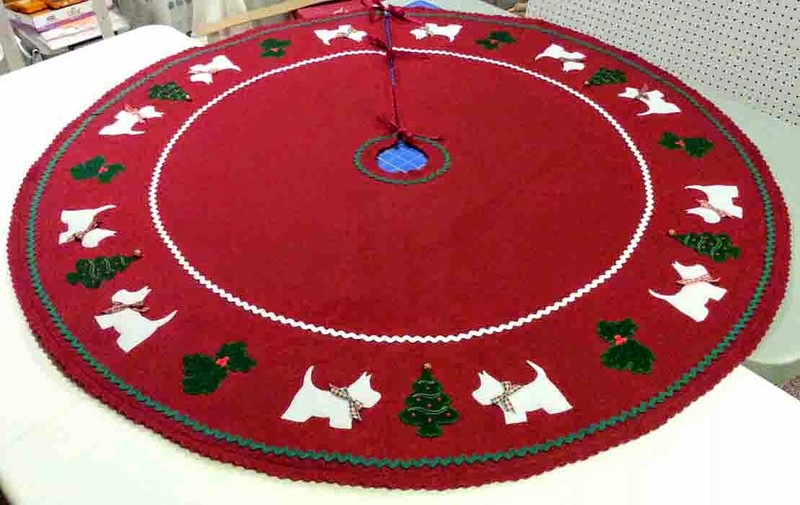 The event was advertised as a day of "Serging, Sewing and Sew Much More" and since the focus was supposed to be on the machines and software I already own, I was really looking forward to picking up a few ideas and tips. First, I have to admit to being quite a bit sleep deprived on Wednesday morning. I'd been out late Tuesday night watching the Mets come back in the bottom of the 9th to defeat the Padres (an example of just why it is necessary to stay until the very last out is recorded!). It was also my first (and very likely only) opportunity to watch a game from one of the suites at Shea, so there's no reason to leave early when you have a nice warm, dry seat. It was a little rough getting up and focused on sewing at 10am on Wednesday. Even though I'd had my usual cup of coffee at home, I was very glad to find plenty of hot coffee waiting when we arrived. I even indulged in a few Dunkin Munchkins before the presentation got started. 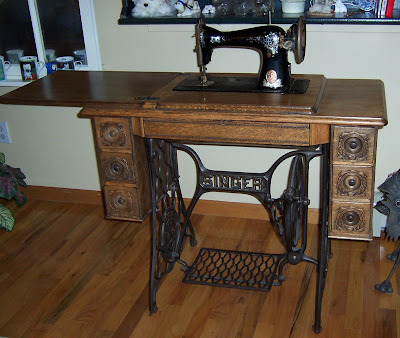 There were about 10 or so attendees and most of us owned either embroidery/sewing machines or sergers or both. When we arrived, we received a "goodie" bag with a nametag, a menu for ordering lunch and a few other notions. My bag included a scented candle wrapped in a fat quarter of pink checked flannel, a pack of Schmetz topstitch needles, 3 spools of Madeira Polyneon thread, a retractable measuring tape with the "Keeping the World Sewing" logo on it -- in orange, some coupons for JoAnn, and a folder filled with hand-outs for various projects. A pretty good "haul". After we filled out our lunch orders, the presentation began. Kothy is a freelance Viking Educator and from the very beginning it was quite apparent that she is quite knowledgeable about all the various topics scheduled for the day. She started off talking about serging -- she explained to us how the loopers and needles work together to sew a seam and why it is so important to thread the loopers and needles in a particular order. She also shared some tips on threading with us. The important features to look for when buying a serger and why the prices can vary so widely were also discussed. Then she demonstrated how to use a piping foot on the Huskylock 936 serger to insert piping into a seam in one step for projects such as pillows or pillowcases. Very cool! She even uses the piping foot to insert zippers! Kothy also demonstrated how to stitch a ruffle using the serger's differential feed and a gathering foot. I don't really do much gathering or ruffling -- it's just not my personal style -- but I did pick up some tips and ideas for other projects I have bouncing around in my head. I may be remembering some of these out of sequence -- but I believe the next topic was about several of the clear presser feet with guides for the sewing machines. There's a clear 1/4" piecing foot with a guide for straight stitching an accurate 1/4" seam, a clear seam guide foot for sewing an accurate 5/8 seam for most garments and a clear B foot with a guide. I already own the first two; I may have to add the the third sometime soon. Kothy demonstrated how she applies binding to quilted items by machine using steam-a-seam, a left edge top stitching foot (another one already in my collection) and the clear 1/4" foot with guide. She also showed us how she does perfect mitered binding using the same items plus a "minute miter" from Martelli. It was amazing. I'm not a quilter, but I have done several projects that required binding and I was not completely happy with the way it was applied; now I have another method to try next time. In September, several new feet should be introduced, but we didn't get a sneak peek at them. The Fab-u-Motion/Fabric Mover table for free-motion quilting was also demonstrated. This is a nifty device that will work with any sewing machine that has a compatible foot pedal plug -- the machine does not have to be a computerized model. Kothy explained how the table works with the sewing machines and how the "cruise control" works to regulate the stitches. This table is available with or without the cruise control. Then she started passing out samples of quilts and other items that she free-motion quilted in no time at all. They were all beautiful. In addition to free-motion, she demonstrated thread painting, in which she quickly sketched a flower in ink on a piece of fabric, then used the Fab-u-Motion table to embellish it. In less than 10 minutes she had a very pretty thread painting! I know at least one of the women was so impressed she bought a Fab-u-Motion during the break! Later on, the new ER 10 embellishment/felting machine was demonstrated. It works without thread. It has multiple needles (actually tiny knives) that move up and down and embed the fibers of two fabrics into each other to "fuse" them together. It can be used to attach yarns to fabric, similar to couching, only without extra thread. I think a couple of these found new homes that afternoon. Kothy discussed machine embroidery on garments using wash-away stabilizers and passed around samples of purchased blouses, sweater sets and other items which she embellished with machine embroidery. One suggestion I took away from that part of the presentation was to use a Sensor Q foot for embroidery; I'd never heard that suggested before. I thought the Sensor Q foot was for free-motion quilting, and since I don't quilt, that's one foot I hadn't added to my collection. But Kothy said she uses it for all her embroidery, too. I still don't quite understand why it's better than just using the R foot, but I haven't seen it in action yet. I bought one and will have to test it out very soon. At the end of the day, Kothy gave an overview of the 4D Embroidery software system and explained which 3D components and packages relate to the new 4D counterparts. This was a segment I was especially interested in, since I had upgraded to 4D earlier this summer and although I like the changes, I was having some issues -- mainly because I just don't have a lot of experience with digitizing yet. But 4D is not just digitizing; Kothy showed us some of the new configuration wizards for setting up our machines, file preferences, thread ranges and so on. Some of this was new to me; other bits were merely review. She also demonstrated the Express Design wizard -- there are actually two wizards; I had not been aware of this fact. One -- sort of a "lite" version -- exists within the Embroidery Extra module. The other -- the version I had been using -- is a more "powerful" wizard within the Design Creator module. There are slight differences . . . and that's when a light went on in my head about the rainbow design I was working on. At the end, Kothy showed us her "Simply Teach Me" series of CD's for learning how to use the 4D Embroidery System. I ended up buying Vol. 1 which covers 4D Embroidery Extra, Express Design Wizards, 4D Configure, Vision and Organizer AND Vol. 2 which covers 4D Design Enhancer, Stitch Editor and Design Aligner. I'm hoping Vol. 1 will be a good reference tool and refresher; Vol. 2 should be lots of brand new material. I've been using the Stitch Editor but have never tried the Design Aligner. When Vol. 3 is released, I think that's the one that covers Design Creator (digitizing). I'll have to get that one eventually, too. We also were told that there will be an update to the 4D Embroidery system this fall -- but we couldn't pry out of her exactly what the update will be, only that we'll really be pleased with it. Apparently, the 4D system was released earlier than originally planned because of the new Windows Vista with which 3D Embroidery is not compatible and this "update" is something that was not ready earlier this year. I wonder what it could be? At the very end of the day, door prizes were drawn and I was lucky enough to win! I won a red zippered Viking bag full of good stuff: an Omnigrid 24x18" cutting mat, a Disney Cars fabric bundle, a sample pack of 9 spools of Robison-Anton threads in rayon, cotton, metallic and twist, a fleece cutting ruler, and a Husqvarna Viking Mr. Teddy Embroidery kit with the CD and supplies to stitch one full teddy. Now that's a haul! Because I already had the fleece cutting ruler and I had a red tote bag from last year's prize, I passed each item on to two of the other ladies. Somewhere during the day we had a break for lunch and I should say that the food was very good. I had chicken caesar wrap and I enjoyed it. So it was a very good day, though a very long one. And full of great ideas.